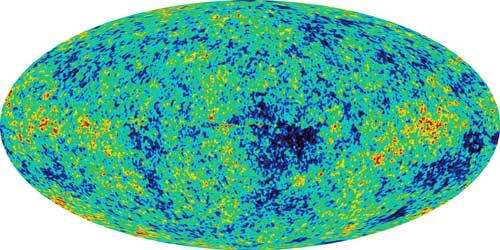 I’ve talked previously about the cosmic microwave background. 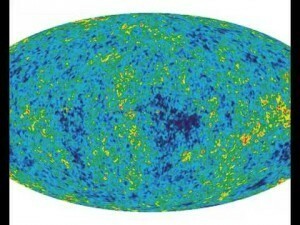 For those not familiar with the CMB, it is the light energy left over from the big bang. While it was once very hot, as the universe expanded it has cooled, so that now it has a temperature of about 2.7 K.
Most people are familiar with the images like the one above. This particular image is taken from the WMAP (Wilkinson Microwave Anisotropy Probe) data, processed a bit to remove the effects of our galaxy and related biases. It presents the entire view of the sky, similar to a flat map of the Earth. The red regions are where the temperature is slightly hotter, and the blue regions slightly cooler. What’s truly amazing about this image is that it’s an observation of the first light of the universe. Within the first few minutes after the big bang, nuclei, electrons and photons formed, but for quite a while these were so hot that the light produced was quickly scattered or absorbed. Finally after about 380,000 years the electrons and nuclei formed atoms, and the light of the universe could finally travel freely through the universe. 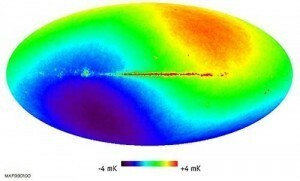 The image below is a map of that first light. It is the earliest direct observation of universe we have. In human terms it would be like having a picture of a centenarian when they were two years old. It’s amazing that we can take such a detailed image of such an early period of the universe. Observations such as these have much to tell us about the history of the universe. For example, it is clear from the image that the early universe was not uniform. There are hotter regions and colder regions, which means that even in its earliest age the universe had a structure to it. It did not begin as a uniform high-density blob. There is much more these images can tell us if we look more closely, but that is a topic for next time.